OLD PARKED CARS. 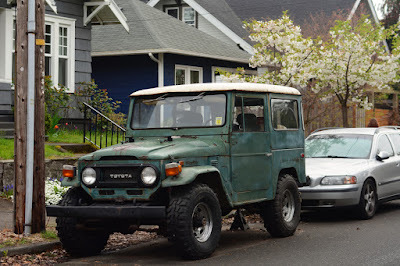 : 1972 Toyota Land Cruiser. Awesome. What's with the jack stand? Wow! Nicely photographed...love the picture with the gal walking her dogs. Love all the color contrasts also...Bravo. It's almost like some aliens or a mad scientist covertly took over all car design/manufacturing after 1995 and just made everything look terrible except a very few select makes and models. 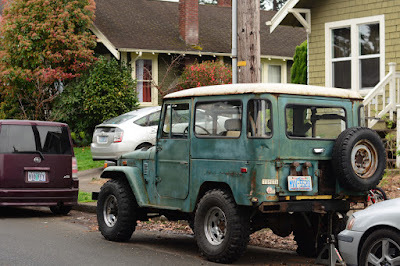 Even after the mid 1970s many American cars lost their looks but there were still makes and models that looked great like the Bronco, Scout, Land Cruiser, BMW, Mercedes etc. Vehicles used to look like this, it's absolutely wild. And most of the population today buys the new vehicles thinking that they're actually driving something that looks good/cool. They're completely oblivious to the fact that they aren't. It's like most women will care about makeup, clothes and shoes to a ridiculous degree and then they go and own a bland soulless new vehicle. Since they care about their physical looks why not extend that to their car? This is my favorite OPC in awhile. The color, the wear and brand new off-road tires. I think I know this FJ if it used to live off of Sandy blvd. I may have even photographed it and not posted pics. I used to see it driving around town. I was once riding bmx across the street when it returned home. The driver got out, and she was wearing a skirt and the most wonderful white high heels. That was a good day. she sounds like future ex wife material, Tony. These things are fetching upwards of $30,000 these days. In restored condition. But it's the patina that gives this one magic! What, no power runningboards? Are you sure it's a Land Cruiser??? Nice find. 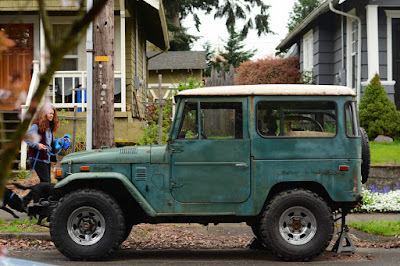 Not the biggest fan, and not surprised with its rust. From my childhood, I remember how these would dissolve in less that 5 years. A shame, because the mechanicals are unkillable. I also remember the ride was harsh, VERY harsh. Dad had one of these and a Range Rover (the 2dr one) at different times. I'd take the Rangie any day. The V70 behind, and its sister the XC70 from that generation are still highly coveted by its owners. Oh, great. The wheel chock is against the rear wheel with the least weight. Idiot. Tire stops go on the side that is not jacked up. Actually, it should really be at the driver's side front wheel, since the jackstand is holding some of the rear weight.